Here are decals of Brotherhood of Evil Mutants members Toad, Mystique and Sabretooth, now you create a super-villain team to accompany Magneto and take down the x-men. Don't forget to download them on Flickr in full scale (300dpi). If you do use these decals, I would love to see how it turns out and where in the universe it ends up. So do send me a link to any pictures or MOCs you have either through Flickr or any of methods on the bottom of the image. Enjoy! Here are a couple of decals for the Twelfth Doctor portrayed by Peter Capaldi, don't forget to download them on Flickr in full scale (300dpi). The Decals are formatted in CYMK colour mode, the colours may look too saturated on-screen, but it will print correctly. (depending on your own printer settings) If you do use these decals, I would love to see how it turns out and where in the universe it ends up. So do send me a link to any pictures or MOCs you have either through Flickr or any of methods on the bottom of the image. Enjoy! “Have you ever thought what it's like to be wanderers in the Fourth Dimension? Have you? To be exiles? Susan and I are cut off from our own planet - without friends or protection. But one day we shall get back. Yes, one day….” The Doctor All four minifigures are custom designed to represent the first ever Doctor and companions. The featured models were created in Bricksmith, converted LeoCAD, and imported and rendered in Cinema 4d, these images are some of set for project over on LEGO Ideas, you can go further into the history and check out the full proposal, or if you want to see this as a set, please vote for it there. Using this image as a reference, I'm guessing your results ended up like the blue stripe, which is normal off-the-shelf masking tape, which due to a high paper to plastic content means the paint bleeds into the grain and absorbs the paint. You want to use a better quality tape, the best widely avaible tape is Frogtape which is green, or even better is plastic pin-striping tape which can be found model shops and some warehouse stores. As a couple of sidenotes, when masking off, use your nail or another piece of LEGO and spend a good 10-20 seconds pressing down the tape to make absolutely sure there is no air bubbles or gaps in the tape. Avoid masking off with paper, always with plastic. And finally build up thin layers of paint rather than one heavy coat, a heavy coat will build up along the tape and can adhere to it, maing removal a messy job,it also create a lip, which isn't very pretty. ^_^ Hope that helps. -Use old parts that can be trashed if needs be. -Use cling film pulled tight to avoid any creases that will disfigure you sculpt. Tin/Aluminium foil can be too thick when working with minifigure parts, it also creases rather than stretch which means it doesn't keep flush to the LEGO part, unike film. -You could sculpt straight onto a old part, wait for the Milliput to fully dry out and harden, then heat up the sculpt, both pieces should become a bit more supple and you can prise them apart. Obviously, don't burn yourself. ^_^ -If you're after multiple part, you could always knock up a mold and cast from it. With the Release of LEGO: MARVEL Superheroes on the way I thought it was time to make an Agent Coulson Minifig, cos this universe needs one! So inspired by the new series of 'Marvel's Agents of Shield' being broadcast and what references on LEGO Coulson exist, that's what I did, along with a few members of his handpicked task-force to accompany him. Agent Coulson Leo Fitz Jemma Simmons Click on any image to go to my Flickr Page, where the full size image can be downloaded for your enjoyment! (Colours may appear a little strange on-screen, this is because they are designed for printing, so they should appear correct when printed) :) If you do use this decal, I would love to see how it turns out and where in the universe it ends up. So do send me a link to any pictures or MOCs you have either through Flickr or any of methods on the bottom of the image, enjoy! This Decal is for Personal Use Only! This Decal is NOT for Commercial Use! Probably the most famous Meme in the Star Wars Universe, definitely the biggest in-joke. From a simple, podgy extra running around Cloud City with a Ice Cream Maker as a prop, to a Hero of the Rebellion escaping with the City's Memory Core, holding the names of the Rebel's biggest financiers. This guy epitomises the Star Wars fandom and the Expanded Universe, where any background extra can get a back story tightly woven and is integral to the main plot of the films, all from a couple of frames screentime. He's a tribute to the fandom's sense of humor, and devotion they have to the series. After doing a little research into Bespin and Cloud City for Episode One of Nar Eurbrikka, I came across this guy and thought that I just MUST have a minifigure of the guy to play around with. ^_^ Click on either image to go to my Flickr Page, where the full size image can be downloaded for your enjoyment. 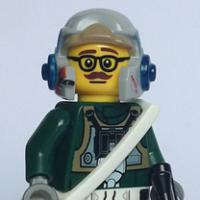 Surprised nobody's made a LEGO version of Willrow to date (that I could find). Thought he might have turned up in the LEGO Star Wars Games as background joke/tribute, but nothing, where's the Willrow Love? ALSO, THIS GUY WOULD MAKE AN AWESOME COMI-CON EXCLUSIVE! Rebellion Pilot Concore Reporting for service.